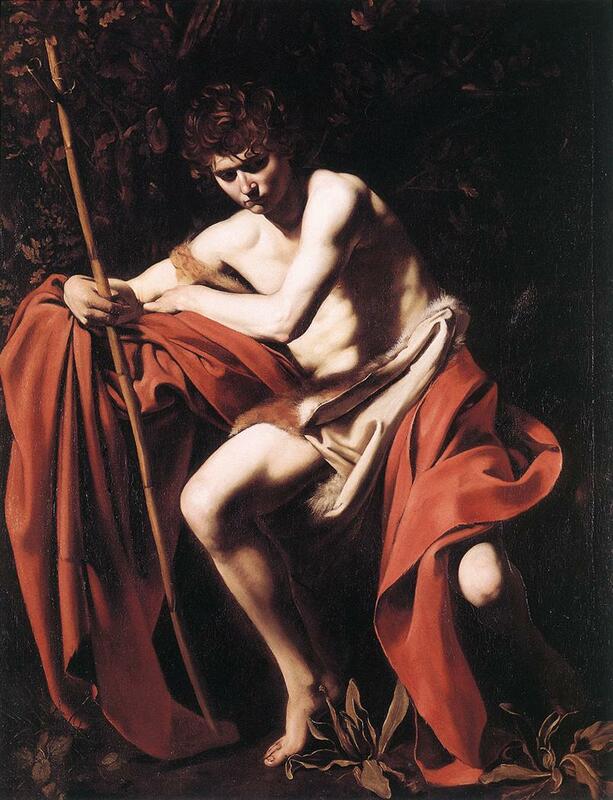 "Now try and picture this..."
'Young Saint John the Baptist' (c. 1600) by Caravaggio. 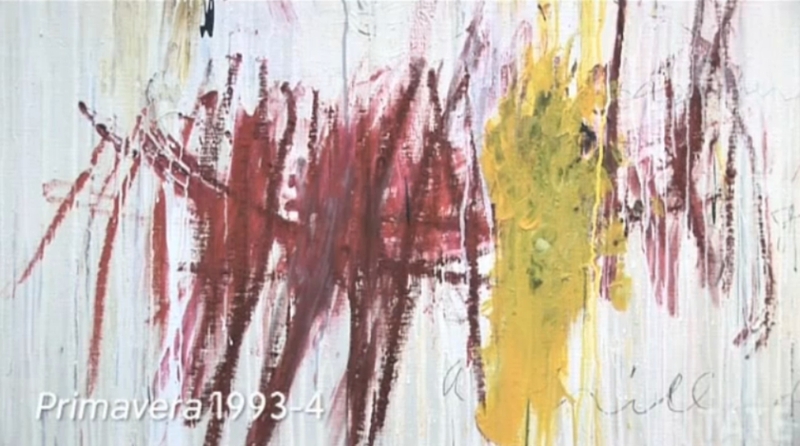 As illustrated throughout this website, an artistic perspective clearly informs John Squire's oeuvre. This range includes: pinching colours from an artist's palette (see Degas and Bonnard); restaging and superimposition of artistic works; perceiving an artwork to embody a subject (see Full Fathom Five, Going Down and Guernica); forming a narrative to a song or music video from paintings (see the Ten Storey Love Song video and Marshall's House LP); 'carving' into an artwork (see the Fernand Léger artwork here); multiple reproduction of an artistic piece (see here). I would also suggest the possibility that Squire 'steps into' an artwork, as with the Wyeth proposition made here. Jackson Pollock had such significant appeal to Squire because his art seemed like the visual equivalent of the feedback and masking of The Jesus and Mary Chain. This intimate relationship between art and song was most evident when Squire based the entirety of his second solo album, Marshall's House, on the paintings of American Realist, Edward Hopper (1882 - 1967). Discussing his new series of artwork, 'Re-Engineered Garments', on The Culture Show in 2008, Squire draws comparison between specific musical and artistic techniques: "These ones start with the fabric and they're then embedded in clearwax. Then I build up a variety of layers so that I can work backwards down to those by scraping it away. It's like backwards overdubbing." Squire also sought a synesthesia of music and art on his Nefertiti series of artwork. "I used to listen to music when I was painting. Recently, in the last few years, I've much preferred to work in total silence. But there's a real connection between the things I love about music and the things I love about paint. I discovered them at the same time and they promoted each other to me." 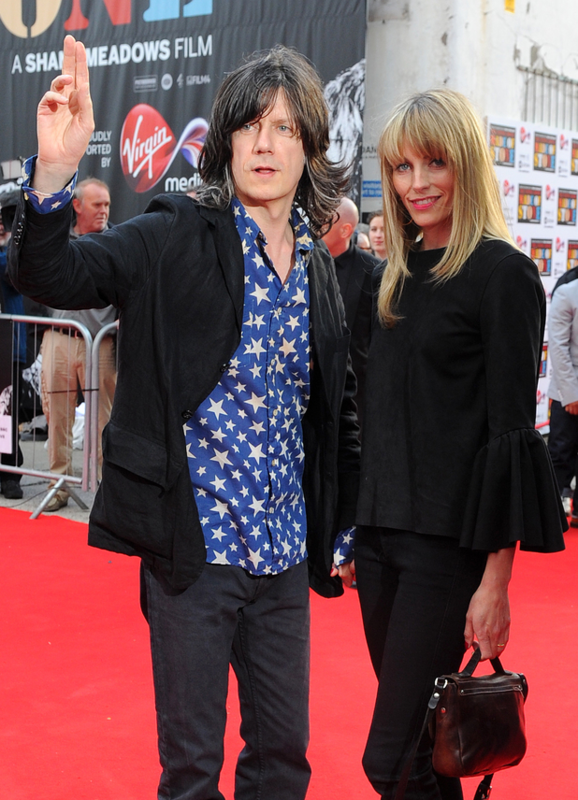 In July 2007, John Squire announced that he was quitting music to concentrate full-time on his art. 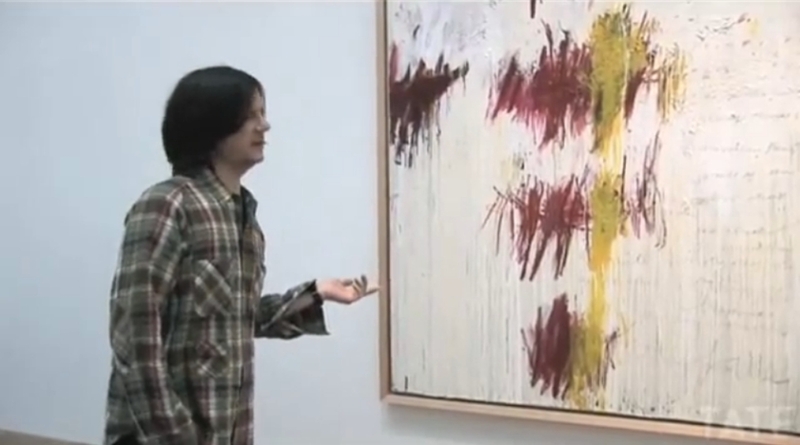 A TateShot video feature, in which John Squire examines Cy Twombly's Quattro Stagioni (1993 - 94), illustrates how quickly the guitarist forms a narrative upon perusal of a painting. Motioning towards 'Primavera' (1993 - 94), he muses, "The boats in the Spring piece are a recurring motif in his work. They could be ferrying the dead across the River Styx, or maybe they could be allusions to funeral barges or warships." The theme of How Do You Sleep, the penultimate track on Second Coming, is the beheading of John the Baptist and the subsequent presentation of his head on a plate. 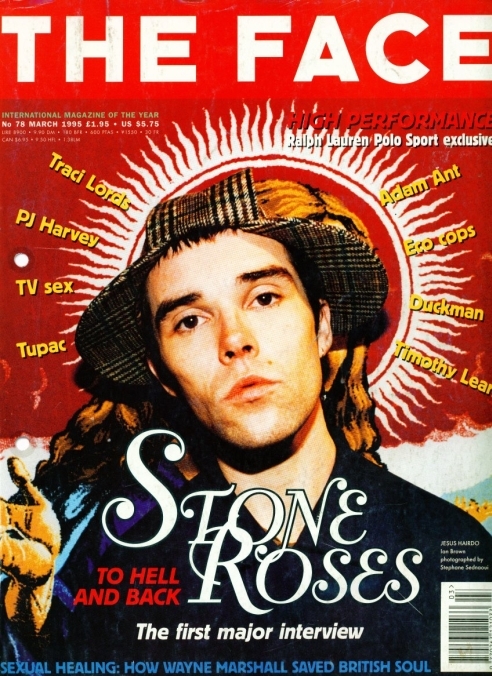 John Squire commented in a 2002 issue of 'Jack' magazine that he felt a certain affinity with John the Baptist, whom Jesus identified as the greatest prophet of the Old Testament era. 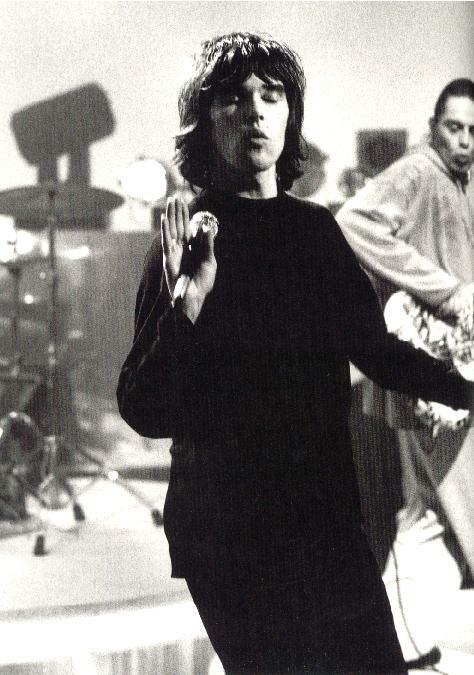 Aside from this being his biblical namesake, Squire perhaps feels more attuned to this 'role', given Brown's display of Messianic imagery, a staple of the rock frontman; the shots below from The Face, March 1995 show the most blatant use of religious imagery by the band for a photoshoot. A persecution complex in The Stone Roses' frontman is diagnosed by Squire on 15 Days, in the lyric, "That crown of thorns suits ya son". 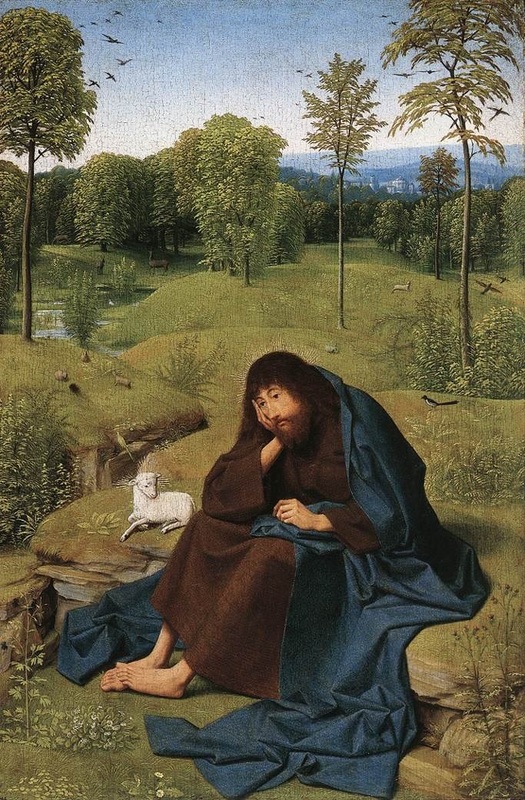 Conscious of Squire's affinity with John the Baptist, Brown's Always Remember Me draws upon the wilderness-dwelling nature of the prophet - a voice crying in the wilderness ("You walked yourself into the wilderness...") - to characterize Squire's plight. Top left: Ian in Messianic pose. Click here for another instance of this, from Hong Kong in 2012. 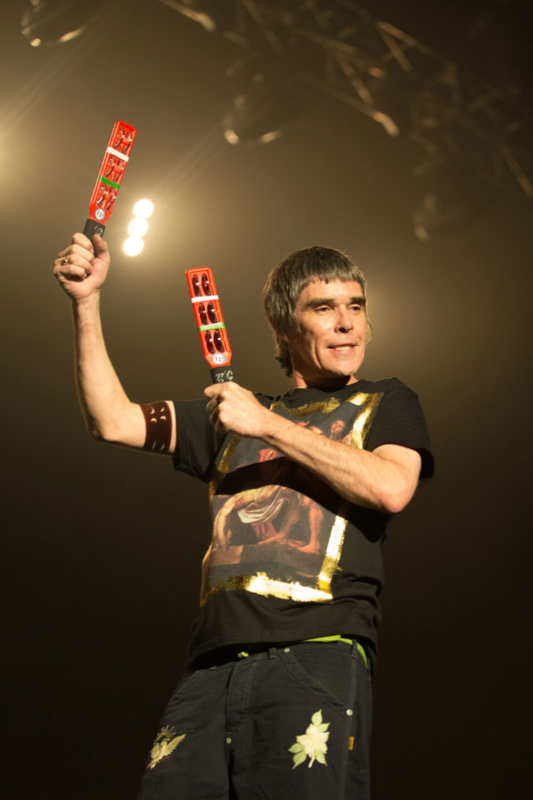 In his motioning towards the crowd in 1989 - for example, on I Wanna Be Adored at Blackpool, just before the vocals kick in - Ian held and used the microphone rather like the way in which a priest would use an aspergillum, a liturgical implement used to sprinkle holy water. The singer often employs biblical vernacular at concerts to address the brethren - for example, "Brothers and sisters, I need your assistance" (taking to the Phoenix Park stage in 2012). Top right: Ian positioned in front of an image of Jesus for The Face, March 1995. 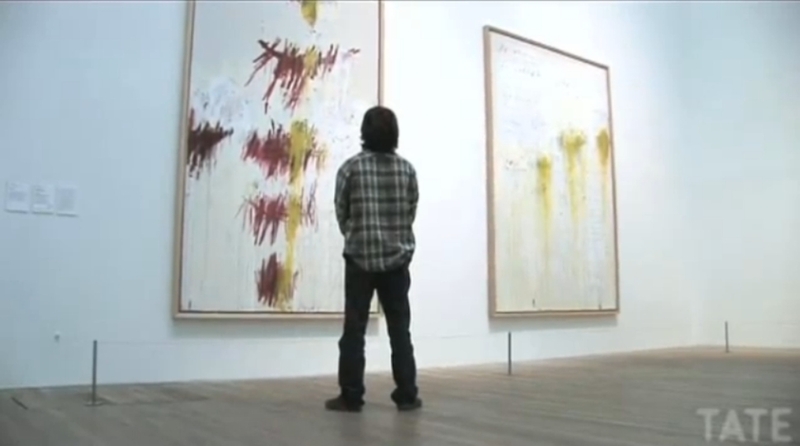 Second row: The figure with his back to the camera is not John Squire. John, suffering from double pneumonia, was not present, and communicated via telephone. For this shot, Ian grabbed interviewer Ashley Heath, making him pretend to be John for the photoshoot. 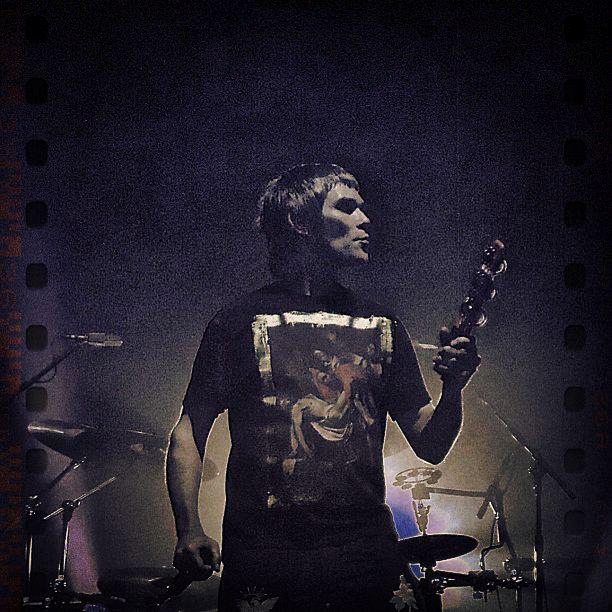 Third row: This shirt worn by Ian Brown at Pepsi Center WTC, Mexico City in 2013 shows The Entombment of Christ (1604) by Caravaggio (fourth row). 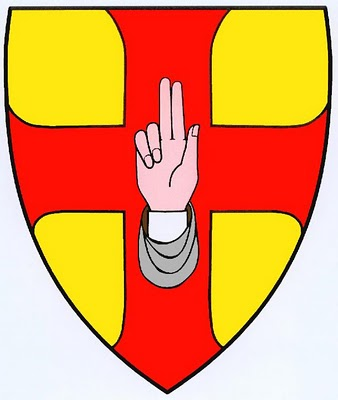 Penultimate row: At the premiere of Made of Stone at Victoria Warehouse in May 2013, Squire could be seen giving the Latin gesture of benediction (A very clear example in history can be found in the coat of arms of Heiligenkreuz Abbey, right). Here he is seen with his hand in this pose (thumb, index and middle finger extended, while ring and little finger are bent backwards), and, inside the venue, he could be seen making the actual gesture. The joke, I suppose, is that he is 'giving his blessing' to the project and the faithful gathered. The most prominent example of its use are the popes, who give the blessing urbi et orbi in this manner. Having their hands raised in this gesture of benediction became the customary way of being depicted in official portraits. The Three Persons of the Godhead (three extended digits) and the two natures of Christ (two digits folded back) are represented in this gesture. 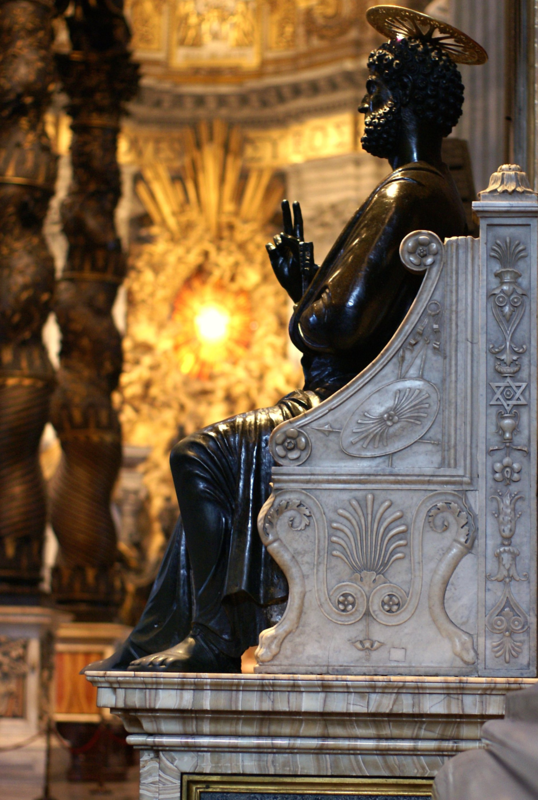 Bottom: Saint Peter in the Vatican Basilica. 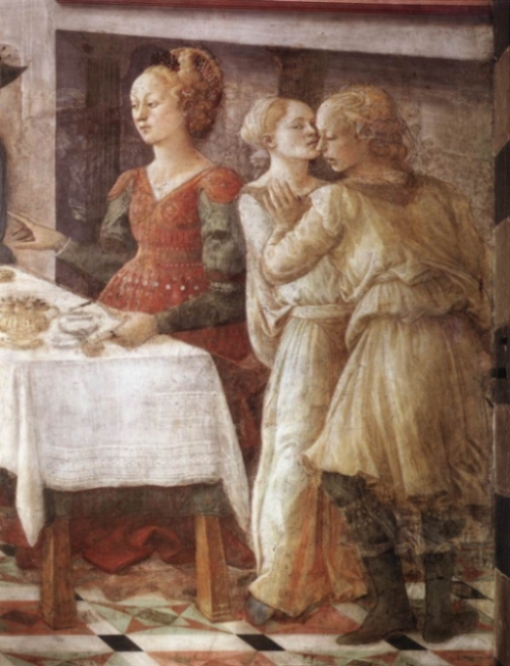 How Do You Sleep, I propose, is based on a painting by Fra Filippo Lippi (1406 - 1469), entitled 'The Feast of Herod: Salome's Dance'. The fresco shows three episodes within the same painting: The beheading of John the Baptist, Salome entertaining the guests with her dancing, and Salome presenting the severed head to Herod. The opening couplet is delivered with cold distance, through the eyes of a hushed observer. The scene is a dinner, with the severed head of a foe resting on silver salver. The pair have history: the decapitated head is dressed with the highest grade military quicklime, an ancient powdered war weapon. 'The Feast of Herod: Salome's Dance' (also known as 'Herod's Banquet', c.1452 - 1465) by Fra Filippo Lippi. Salome dances her way on to the floor. The revellers are charmed, and Herod, following her every movement of grace, soon becomes as much aroused by the dance as by the wine. There is a clever ambiguity in the lyric, "All dressed up for dinner, looked so fine". Those attending the banquet are "all dressed up for dinner", yet so too is the severed head of John the Baptist, in its presentation on a salver, as if with 'dressing'. On the opening verses, Brown's voice is croaked and sits softly inside the track's instrumental. Worn and tired, there is little wrestle, barely a hint of strain against the surrounding sound. After a short, soft percussion intro, Squire and Mani kick the tune into life. The penultimate tracks - This Is The One & How Do You Sleep - on each of the two Stone Roses albums have a John the Baptist theme, and serve as harbingers to their respective Christ-oriented finale (I Am The Resurrection & Love Spreads). John the Baptist was beheaded at the request of Salome, King Herod's stepdaughter ("I've seen your severed head at a banquet for the dead"). Salome danced and delighted the inebriated king who promised her anything she wanted, even up to half his kingdom. Salome's request for John's head was prompted by her mother, Herodias, who wanted revenge on the prophet who had condemned her incestuous marriage to Herod. 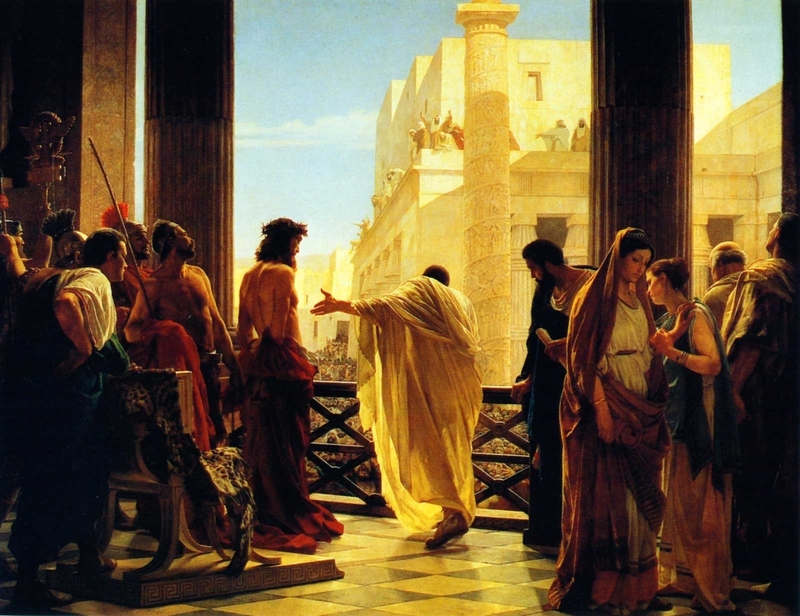 Herod recognized the voice of conscience in John the Baptist, but was committed to sin. John the Baptist was beheaded, and his head was presented on a plate ("Your shining silver salver") to Herodias. Squire's stinging lyric is partly aimed at former Stone Roses manager Gareth Evans, whose split with the band was far from amicable. In his solo career, Squire would again insinuate that Evans shouldn't be able to sleep at night; the maverick manager is now "the country boy with 33.3 recurring nightmares." 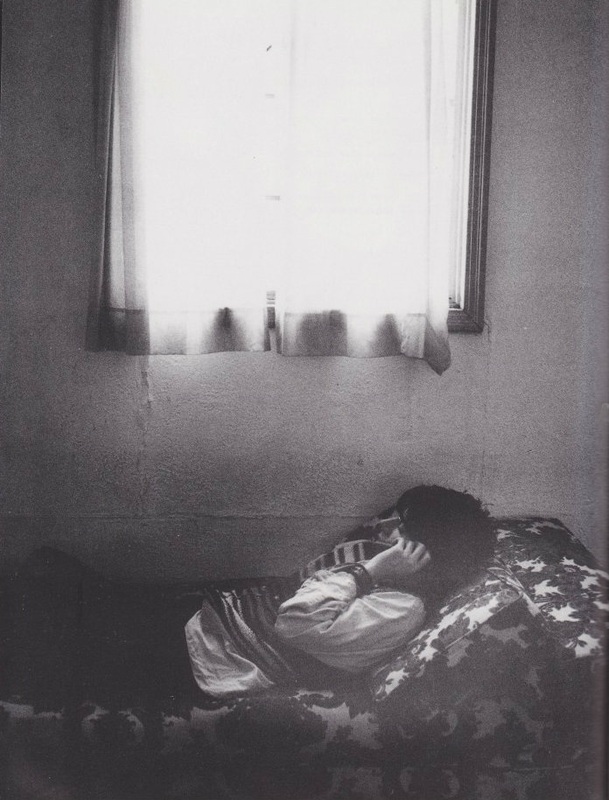 Airing resentment towards an old acquaintance, the song has parallels with John Lennon's 'How Do You Sleep ?'. '99 and a Half Won't Do' (the penultimate selection by The Stone Roses on Radio 1's Evening Session, in March 1995) by Dorothy Love Coates & The Original Gospel Harmonettes is also a possible influence here, given its strong John the Baptist theme. As the chords rise gently, Squire imagines tucking into his foe's head, kissing a lifeless mouth and prising out an apple from rotting teeth. The lyrics begin to evoke visions of vengeful pleasure - a pleasure derived from toying with the corpse of an enemy. The bitterness is growing in intensity as the guitar chords climb towards triumph. Left: Margaret Medlyn as Salome, in the 2003 Antony Ernst production. Squire's lyric here is perhaps visualizing a carnal Salome. Ernst portrays Herod as a fat, bejewelled clown whose idea of vice is to suggest that Salome share an apple with him. The apple, of course, has religious connotations with Adam and Eve, and the passage of sin. 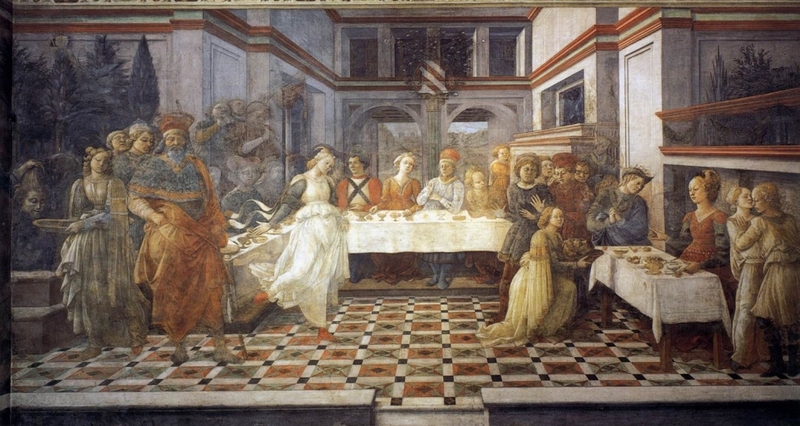 Right: The Dance of the Seven Veils is given a symbolist treatment. The Pennie Smith photo below is perhaps restaging the stances of the two figures beside Herodias. 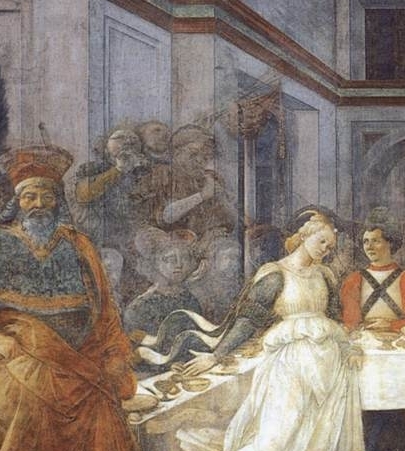 Left: Detail of 'The Feast of Herod: Salome's Dance'. 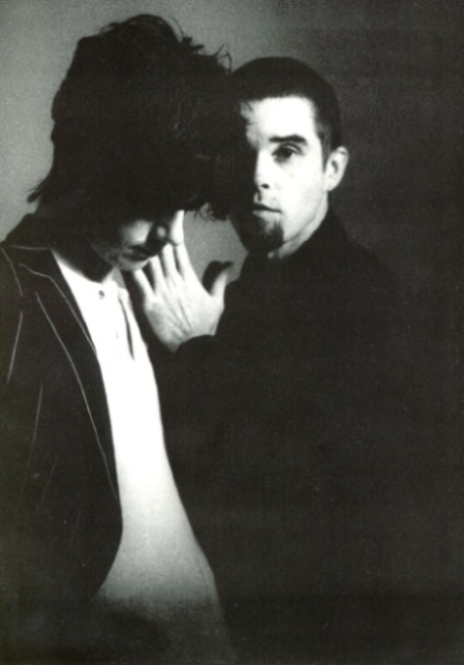 Right: John and Ian, 1995. In the opening bridge, Brown brings a sharper focus to his ire. The previous verses follow a line-by-line exchange of dinner-dressed sexual pleasure for chemical weaponry and decapitated corpses. Here, the curtain is pulled to reveal the true enemy at hand. The playful imagery could only last so long. Vengeance is in store for the house. Left: "The orchestra played the sweetest serenade..."
Right: "May all their ghosts come back to haunt you...". An apparition looms eerily above Herod's head, disturbing his sleep, torturing his conscience, and haunting his dreams. The verses harbor a bruised cry of insistence that the bitterness of failure would only serve to sweeten the taste of success. The second bridge offers a final vow to turn the tables. The author's dreams are his enemy's nightmares. Battle lines have been drawn, as the song progresses at a furious pace. "Then they are to take some of the blood and put it on the sides and tops of the doorframes of the houses where they eat the lambs. That same night they are to eat the meat roasted over the fire, along with bitter herbs, and bread made without yeast. Do not eat the meat raw or cooked in water, but roast it over the fire-head, legs and inner parts. Do not leave any of it till morning; if some is left till morning, you must burn it. This is how you are to eat it: with your cloak tucked into your belt, your sandals on your feet and your staff in your hand. Eat it in haste; it is the LORD's Passover. "On that same night I will pass through Egypt and strike down every firstborn - both men and animals - and I will bring judgment on all the gods of Egypt. I am the LORD. The blood will be a sign for you on the houses where you are; and when I see the blood, I will pass over you. No destructive plague will touch you when I strike Egypt." Life is in the blood. 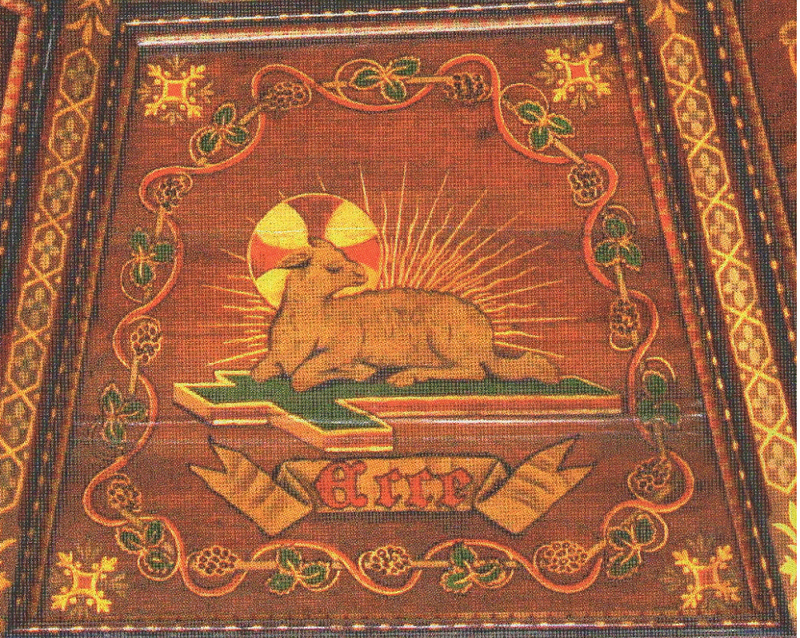 The lamb is slaughtered at twilight, and hyssop dipped in the blood of the lamb forms a cross on the transom. Note the command here to eat the lamb. In order to complete the Paschal sacrifice, you had to eat the lamb that was slain, a way of coming into communion with the one who had died so that you could live. Ecce Agnus Dei qui tollit peccata mundi. 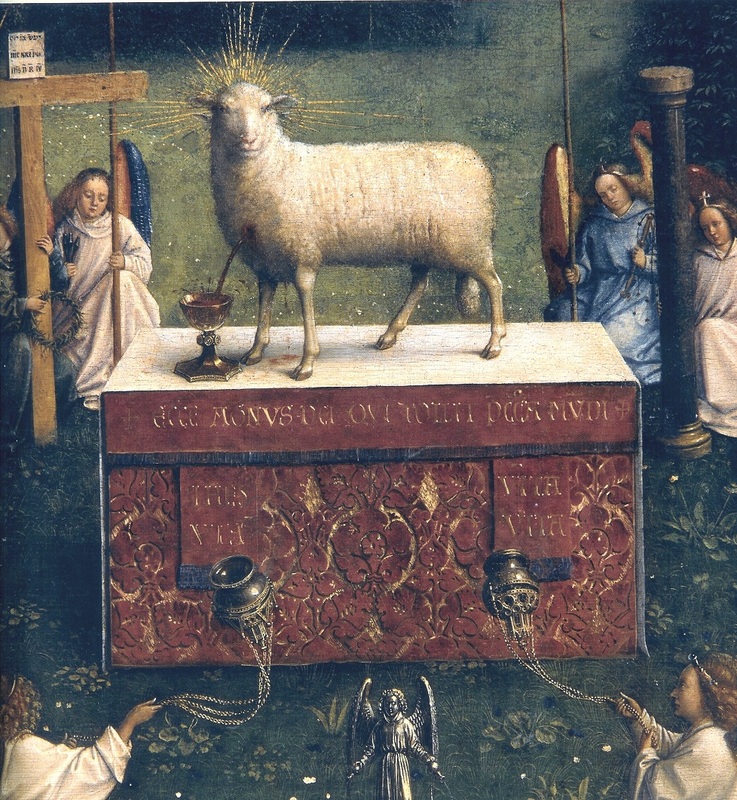 Jesus is the perfect Lamb, the pure sacrificial offering. 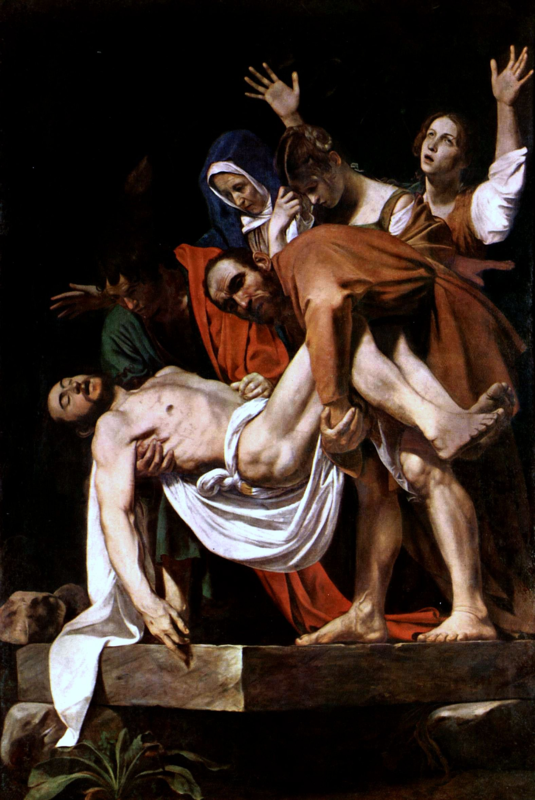 Ecce homo. In order to share fully in His sacrifice on the cross, Christians are called to feed on the Lamb of God who is the Bread of Life. We receive the Body and Blood of Christ in the Holy Sacrifice of the Mass. His Blood is painted over the doorposts of our souls through the reception of the Holy Eucharist. 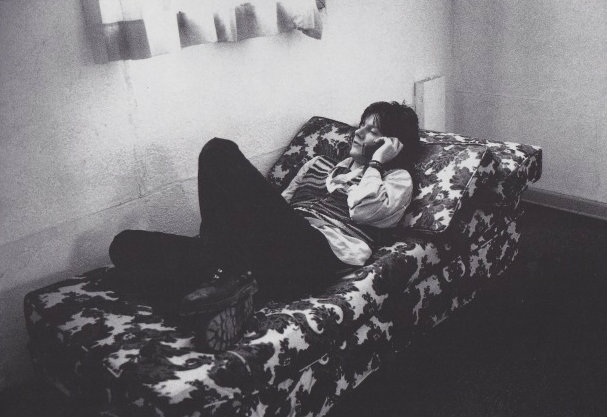 When the angel of death comes knock-knocking and banging at your door... A longer John Squire solo follows, which slides and slips down the fretboard, wailing in sadness and finishing in a short bright flourish, a resolve to persevere. A final chorus is then delivered, the song's anger drawing out to an abrupt, smothered halt as Brown paints a final vision of the angel of death, knock-knocking and banging on the door of his oppressor. 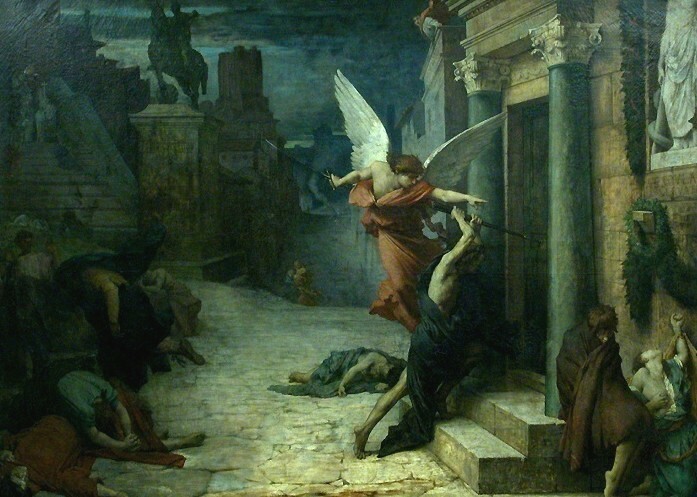 Featured here is 'The Angel of Death' (1869) by Jules-Élie Delaunay (1828 - 1891). 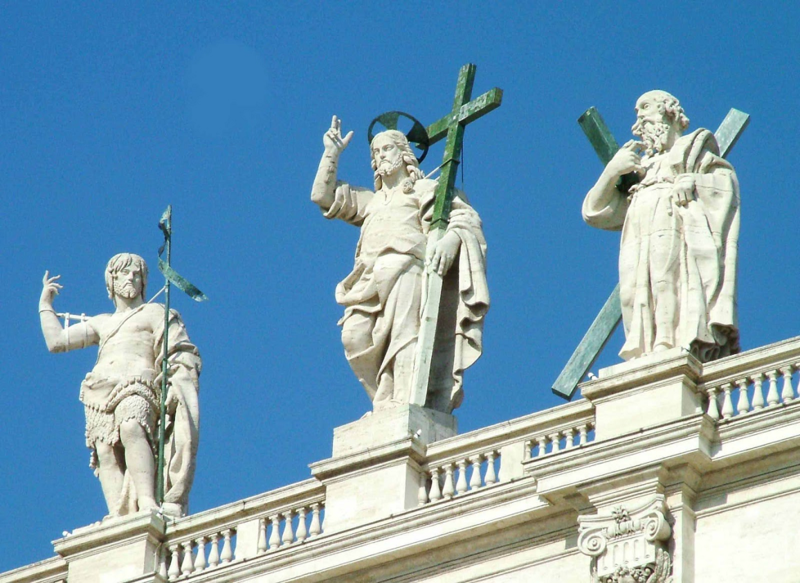 In the Roman Catholic Church, Saint Michael has four main roles or offices. He is the Christian angel of death, carrying the souls of all the deceased to heaven, where they are weighed in his perfectly balanced scales (hence Michael is often depicted holding scales). At the hour of death, Michael descends and gives each soul the chance to redeem itself before passing, thus consternating the devil and his minions. St Michael is the special patron of the Chosen People in the Old Testament and is guardian of the Church; it was thus not unusual for the angel to be revered by the military orders of knights during the Middle Ages. Last, he is the supreme enemy of Satan and the fallen angels. Click here to view 'St. 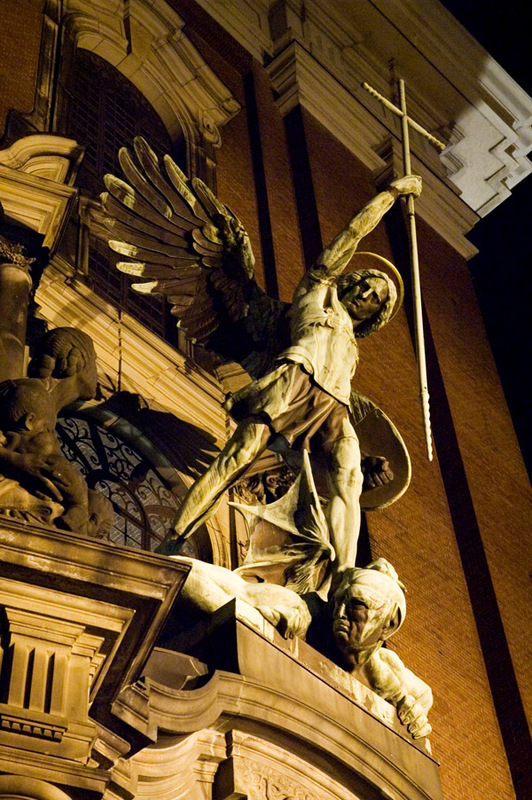 Michael's Victory over the Devil', the sculpture above the main entrance to St. Michaelis Church in Hamburg, Germany. 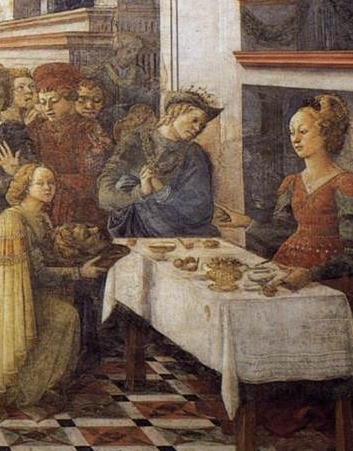 Salome is on her knees ("Get off your knees the party's over"), presenting the head of John the Baptist on a plate; there is commotion behind her, as one woman expresses disgust at what has taken place. 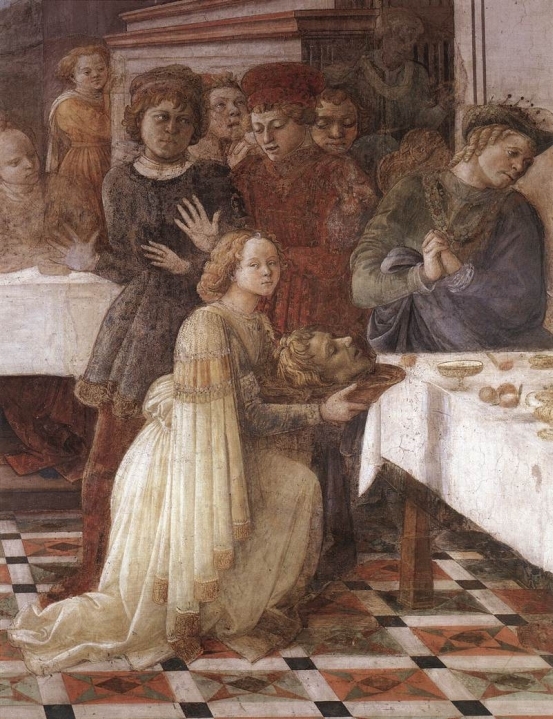 Left: Detail of Salome presenting the head of John the Baptist on a plate. 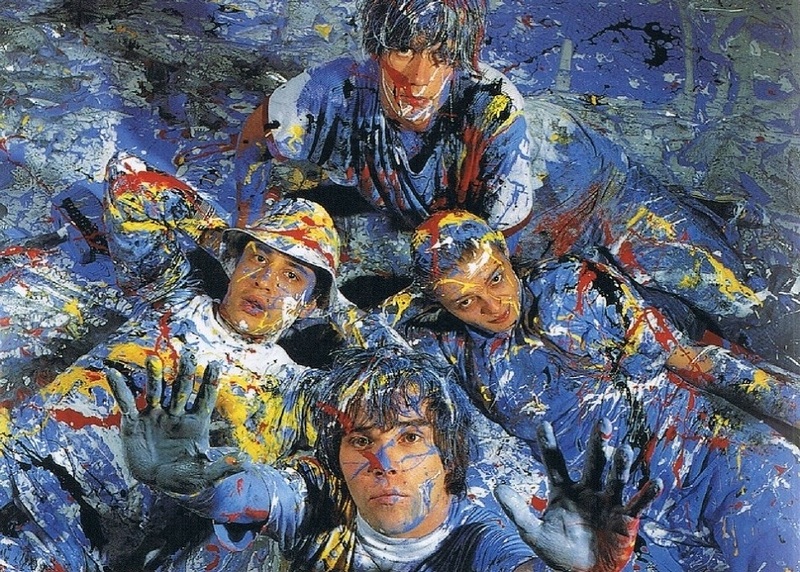 Right: The Stone Roses were certainly familiar with the story of Salome; at one point, serious consideration was given to entitling their debut LP, 'Bring Me The Head Of James Anderton On A Plate.' 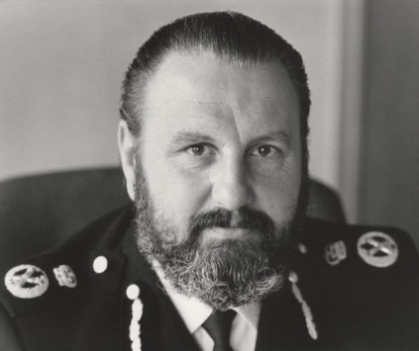 Sir Cyril James Anderton CBE (born 24th May 1932) is a British former police officer, who served as Chief Constable of Greater Manchester from 1975 to 1991. Anderton frequently courted public controversy with his outspoken views on policing and morality. 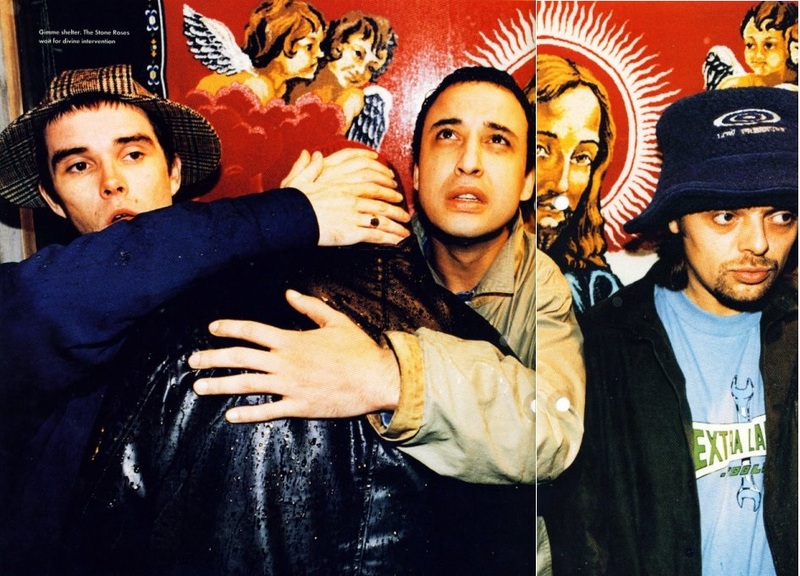 As a professed Christian who claimed to speak with the supreme being regularly and who characterised himself to be an instrument of divine judgement, Anderton came to be known as 'God's copper' (and was immortalized in the Happy Mondays' song, 'God's Cop'). This led to the press and the public questioning his mental health and capability to perform his job appropriately. He was often in conflict with the city's political leadership during the 1980s, particularly over his hardline views on homosexuality and AIDS. In December 1986, Anderton remarked that homosexuals, drug addicts and prostitutes who had AIDS were "swirling in a cesspit of their own making." The Stone Roses took great delight in seeing the Chief Constable's descent from power. 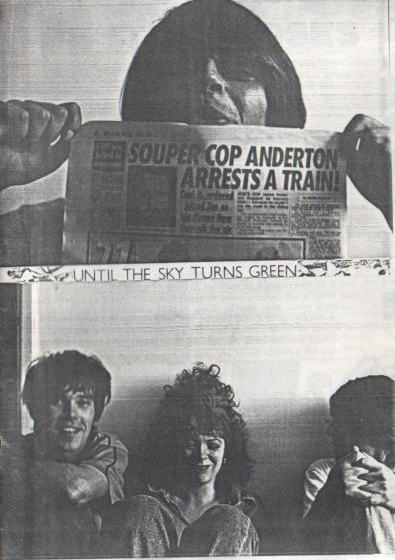 In one photoshoot, Mani can be seen holding up a newspaper with the satirical headline, 'SOUPER COP ANDERTON ARRESTS A TRAIN !'. The final verse arrives after a short, sweet guitar solo from Squire. The guitar licks continue to feed in and out of the sound as Brown arrives at the end of the banquet to gleefully carry the corpse home. To be mounted on a wall, a badge of marksmanship shown off to all who visit. Once more, the mood of anger is intensified as Brown strains to portray this cruel parody of an aristocratic hunting tradition. 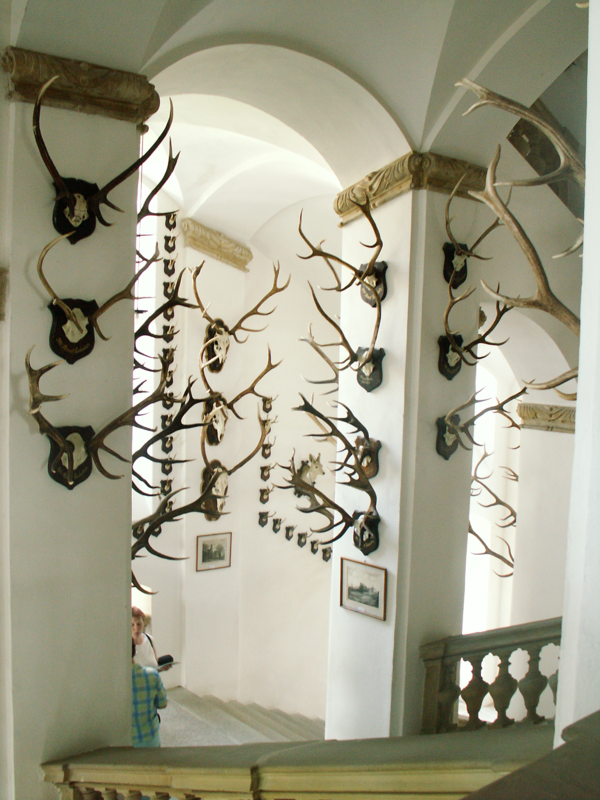 Royal Liechtenstein trophy collection at Úsov Château, the Czech Republic.